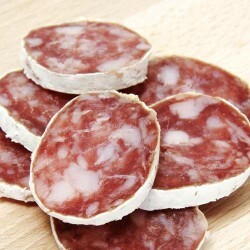 German Black Pepper Salami Pack SizeApprox 1.7 kg ..
CotechinoIngredientsPork, rind, pork fat, salt, saccharose, flavours, spices; flavour enhanc..
Danish SalamiFermented dried salami, smoked over beechwoodIngredientsPork Meat, Pork Fat..
Finocchiona SalamiCured salami prepared with selected Italian pork meat which is finely ground. 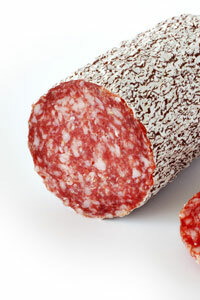 ..
Milano SalamiA mixture of finely ground pork, salt, flavourings and spices. Ingredients..
Milano Salami - MiniIngredientsPork, salt, sugars: dextrose, saccharose; flavourings and spi..
Milano Salami - SlicedIngredientsPork, salt, sugars: dextrose, saccharose; flavourings and s..
Napoli SalamiIngredientsPork, salt, Milk Proteins, sugars: Lactose(Milk), dextrose..
Napoli Salami - Mini IngredientsPork, salt, sugars: dextrose, saccharose; flavourings a..
Napoli Salami - SlicedIngredientspork, salt, dextrose, spices, pepper, smoked flavour; acidi..
Pepperoni (Salsiccia Piccante)IngredientsPork, salt, Milk Proteins, sugars: L..